The Kasp K11960XD High Security Combination Padlock is ideal for outdoor use such as securing gates, garages, shutters, site gates, vehicles and other high security applications. The weather resistant electro-plated lock body with rust free internal components and dual drainage system ensures that the Kasp 119 series is ideal for outdoor use, whilst offering the convenience of a keyless locking mechanism allowing the code to be set to a memorable number of choice. 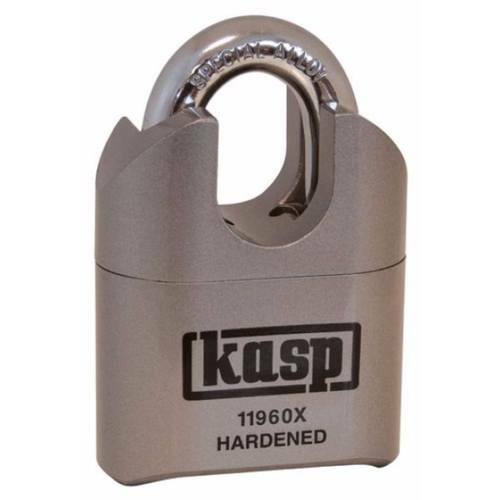 With its heavy weight hardened steel lock body, supertough molybdenum steel shackle and anti manipulation locking mechanism, This Kasp 119 series padlock is amongst the most secure combination padlocks available today. With a Security Rating of 11, you know you are getting a security conscious device. Super tough molybdenum steel shackle for extra protection against hacksaw and cropping attacks. Hardened steel electro-plated lock body for extra strength and resistance to corrosion. Double bolted locking mechanism for extra strength to resist torsion and pulls. Anti-manipulation locking system protects against manipulation attack. 4 dial re-settable combination for added convenience and security. Rust free internal components and dual drainage system for extra resistance against corrosion making it ideal for outdoor use. Closed shackle for added shackle protection to resist shackle attack. Comes Complete with a 10 Year Guarantee from the Manufacture.